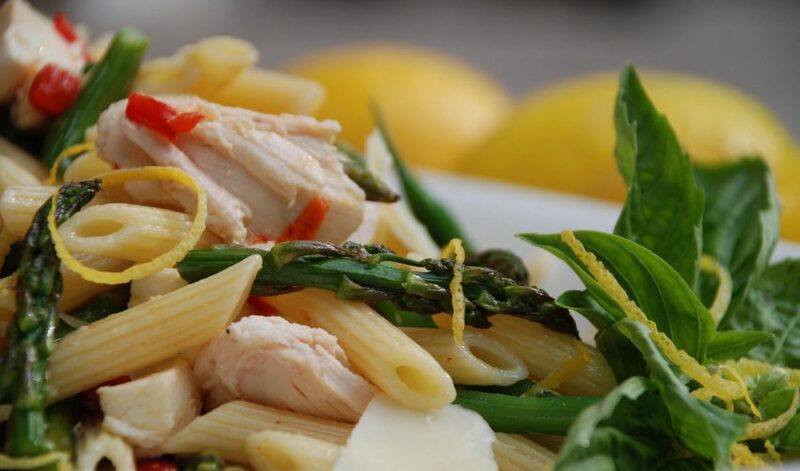 Just in time for the Spring, here is a scrumptious Spring Pasta Salad–great-tasting and easy to do–that the whole family will love and want again and again. This recipe can be easily doubled to feed a crowd. It is delicious! Healthy tip: If you have digestive issues, it may be better to simply omit the grape tomatoes. On a sheet pan, drizzle chicken breasts with 2 tsp olive oil, garlic powder, salt, and pepper. Roast for approx 40 minutes or until internal temp registers 165 degrees. On a separate sheet pan, drizzle asparagus spears with 1 tsp olive oil, salt, and pepper. Roast for approx 4-6 minutes until bright green and tender. Let cool. Slice on a diagonal into 1-inch pieces. Meanwhile, bring a heavy pot of salted water to a boil. Cook pasta until al dente. Drain and cool. Add 1/8 cup of olive oil to a sautÌ© pan. Gently stir in the clove of crushed garlic. Heat oil until it is just hot (not bubbling), approx 4 minutes. You do not want the garlic bits to brown (it will become bitter). Remove from heat and let cool. Discard the garlic pieces. In a large bowl, toss the garlic oil with the drained pasta. Set aside. Discard the skin from the chicken pieces and remove the meat from the bone. Tear the chicken into bite size pieces (or cut if you prefer). Blanch green beans in salted water for approx 2 minutes or until bright green (or microwave for 4 minutes). Cut into bite size pieces. Dice roasted red pepper. Cut fresh mozzarella into å_ inch cubes. Add to the pasta with garlic oil, add the chicken, asparagus, green beans, grape tomatoes, roasted red pepper, and fresh mozzarella. Sprinkle with the juice and zest of å_ lemon. Season with salt and pepper to taste. Using a vegetable peeler, shave the asiago and Parmigiano cheeses on top. Garnish with torn basil leaves and serve at room temperature.